A well-known statue in North Langley was kneecapped by a van that veered off the road following a crash Monday afternoon. At about 12:45 p.m. two vehicles collided near 199A Street and 96th Avenue. One driver was heading south on 199A, while another, in a van, was headed west on 96th, said Cpl. Holly Marks, spokesperson of the Langley RCMP. The van hit the car, then veered off the road, knocking down a metal fence and striking the statue at the Jimy Macâ€™s pub. 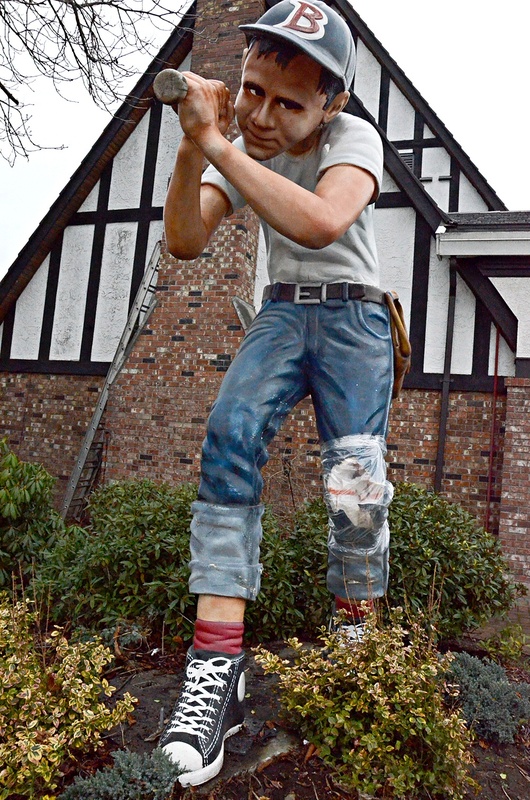 The statue of a young boy holding a baseball bat has been in front of the pub for years. Marks said there were no injuries, but both vehicles had to be towed from the scene.